UNITED NATIONS (AP) — U.N. Secretary-General Antonio Guterres called Friday for an independent investigation into deadly clashes in Gaza between Palestinians and Israeli troops, while Security Council members urged restraint on both sides. The council didn't decide on any action or joint message after an emergency meeting Friday evening. Kuwait convened it hours after the bloodiest day in Gaza since the 2014 cross-border war between Israel and Hamas, the Islamic militant group that rules the coastal strip. 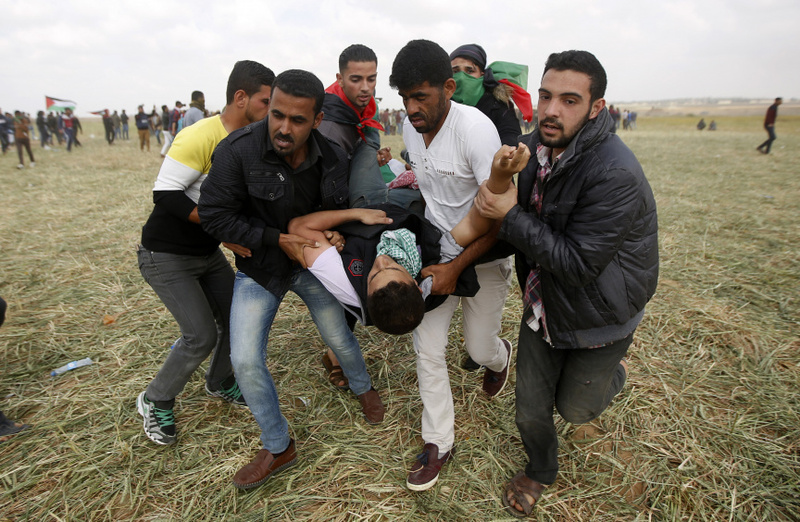 Fifteen people were killed and more than 750 wounded by Israeli fire as thousands of Palestinian protesters marched to Gaza's border with Israel, the Palestinian Health Ministry said. The Israeli military said that thousands of Palestinians threw stones and rolled burning tires toward troops, that Palestinian gunmen fired toward soldiers in one incident and that militants were trying to conduct attacks under the cover of protests. Guterres wants "an independent and transparent investigation" into the violence, spokesman Farhan Haq said. Palestinian Ambassador Riyad Mansour said he was disappointed the Security Council didn't coalesce to condemn what he called a "heinous massacre" of peaceful demonstrators, or to support his call to provide protection for Palestinian civilians. "We expect the Security Council to shoulder its responsibility" and "defuse this volatile situation, which clearly constitutes a threat to international peace and security," Mansour said. Israeli Ambassador Danny Danon said "the international community must not be deceived" by what he termed "a well-organized and violent terror-gathering" under the banner of a peaceful march. "The Palestinians sunk to a new deceitful low so that they could use the U.N. to spread lies about Israel" while its representatives weren't there because of the Passover holiday, Danon said in a statement. Some Security Council members suggested an investigation and emphasized that Israel should ensure force is only used proportionally. Some also made a point of noting Israel's security concerns and calling on demonstrators to avoid violence. They all expressed alarm at the flare-up of conflict in a volatile region. "The situation is extremely worrisome," said Swedish deputy Ambassador Carl Skau. Equatorial Guinea's ambassador, Anatolio Ndong Mba, warned that continuing violence could "escalate out of control and could further imperil what is already a very delicate situation" in Gaza. The U.S., which often complains about what it sees as anti-Israel bias at the U.N., urged all involved in the conflict to lower tensions. "Bad actors who use protests as a cover to incite violence endanger innocent lives," added Walter Miller, an adviser at Washington's U.N. mission. Russia and China, meanwhile, emphasized a need to step up diplomatic efforts toward resolving the Israeli-Palestinian conflict as a whole. Israel and Hamas have fought three cross-border wars in recent years. The protests come as Gaza is in the 10th year of a border closure. Israel and Egypt imposed the blockade after Hamas seized Gaza from forces loyal to the militants' rival, Palestinian President Mahmoud Abbas, in 2007.